The VDA has been rounded off to the next higher ru pee as per the decision of the Minimum Wages Central Advisory Board. The classification of workers under different categories will be same as in Part­ I of the notification, whereas classification of cities will be same as in the Part-II of the notification dated l9th January, 2017. The present classification of cities into areas A, 8 & C is enclosed at Annexure I for ready reference. Deputy Chief Of Army Staff. (X) Directorate General, Defence Lands And Cantonment. Directorate General, Defence Lands And Cantonment. (Xi) Directorate General, Ordnance Factories. (Xii) Directorate General Of Inspection. (Xiii) Technical Development And Production (Air) Organization. Director Of Technical Development And Production (Air) Organization. Project Director, Radar & Communications Project Office. Project Director Radar & Communications Project Office. Deputy Chief Administrative Officer For Group ‘C’ Posts. Senior Administrative Officer For Group ‘D’ Posts. Army And Defence Security Corps Directorates. Of Civilian Switch Board Operators). (Viii) Directorate General, Armed Forces Medical Services. Director General, Armed Forces Medical Services. (X) Directorate General, National Cadet Corps. Director General, National Cadet Corps. Ordnance Factories, Ordnance Equipment Factories. Director, Ordnance Factory Staff College. (Xiii) Directorate Of Public Relations. Defence Research And Development Organisations. Director Of Technical Development And Production (Air). (Xvi) Posts Under Security Office. Chief Security Officer, Ministry Of Defence. Subject: Online generation and recording of Annual Performance Assessment Report (APAR) on SPARROW (Smart Performance Appraisal Report Recording Window) of Group ‘A’, ‘8’ and ‘C’ officers- Extension of timelines for completion of APAR online for the year 2018-19. Central Government Ministries/Departments have been deputed for election duty in the General Election to the Lok Sabha, 2019. It is understood there would be practical difficulties in recording of APAR online as per the target dates prescribed in DoPT O.M.No.21011/01/2005-Estt. (A)(Ptll) dated 23rd July, 2009, through SPARROW platform, for officers deputed for election duty. 2. The matter has been examined in this Department and it has been decided with the approval of competent authority that the target dates prescribed in O.M. dated 23rd July, 2009 be relaxed as one time measure only for online generation, filling up of self-appraisal, reporting, reviewing and acceptance of APAR for the year 2018-19 through SPARROW portal for all Group ‘A’, ‘B’ and ‘C’ officers. The revised target dates for online recording and completion of entire APAR process for the year 2018-19 is enclosed as Annexure. This relaxation is subject to the condition that no remarks shall be recorded in the APAR for the year 2018-19 after 31.12.2019. Where the reporting, reviewing and the accepting authority fail to record their comments within the time frame, the officer reported upon may be assessed on the basis of the overall record and self-assessment for the year, if he has submitted his self-appraisal within stipulated time. Subject: Reg, transfer of NPS to GPF. 2. Further, the cases should be sent through the administrative Head of Department to this office. 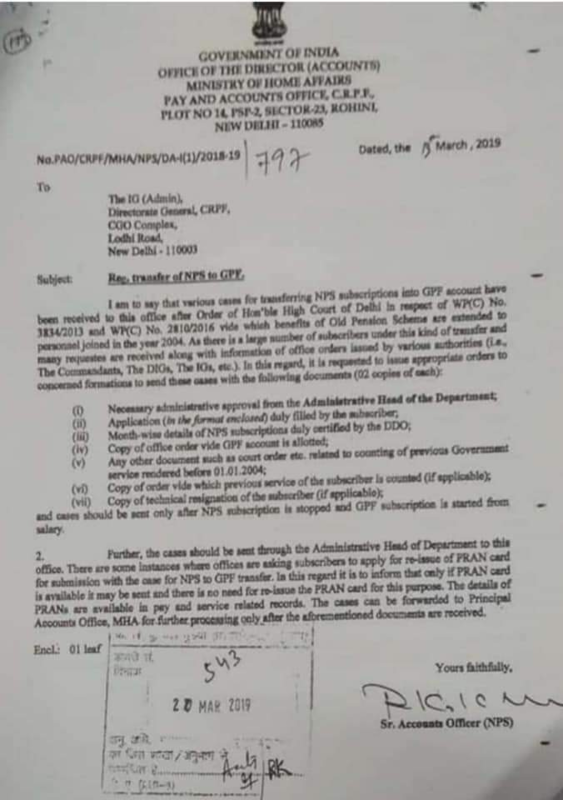 There are some Instances where officers are asking subscribers to apply for re-issue of PRAN and for submission with the case for NPS to GPF transfer Is this regard it is to inform that only if PRAN card is available may be sent there is no need for re-issue the PRAN card for this purpose. The details of PRANs are available in pay and Service related records The cases can be forwarded to principal Account Office, MHA for further processing only after the aforementioned documents are received. You are aware that the Class XII & X examinations held in February/March/April, 2019 have concluded on 4th April, 2019. Results are likely to be declared in the month of may. Detailed circular will also be issued at an appropriate time. 2. National Disaster Management Authority had issued revised Guidelines for. preparation of Action Plan Prevention and Management of Heat-Wave’ in 2017 for addressing the issues al broader level undertaking activities by all Stakeholders in their respective areas to reduce the negative impact of extreme heat-wave conditions. The role of Ministries / Department of Govt. of India in mitigating the effect of heat wave as per the guidelines is attached as annexure. 4. It is, therefore, requested that Preparatory Actions for mitigating the effects of heat wave as per NDMA Guidelines, attached as Annexure, may be taken to further improve the heat wave preparedness for 20 19.